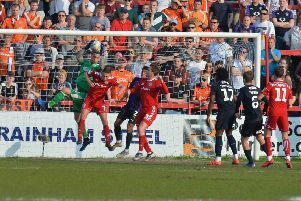 Game-changer Ollie Palmer scored an absolutely crucial last-gasp winner for Luton Town this afternoon as they saw off fellow play-off rivals Blackpool at Kenilworth Road. It had looked like Hatters were going to be held to yet another draw, stretching their unbeaten run to six games in the process, until Palmer, on for Isaac Vassell midway through the half, took over. With the injury time board about to go up, the on-loan Leyton Orient front man used his physical presence to bulldoze a way through the retreating Tangerines' back-line and with defenders falling by the wayside, found fellow substitute Luke Gambin in the area. The Maltese international's right-footed shot was spilled by the otherwise exemplary Dean Lyness allowing Palmer to tap the rebound in from two yards out, sparking scenes of bedlam at Kenilworth Road as the forward was quickly engulfed by his ecstatic team-mates. The victory was vital too as going into the 90th minute, Luton were only in the play-offs on goal difference, but after ending the Tangerines' nine-game unbeaten sequence and completing the double over their Lancashire opponents, climbed to fifth and have a three point buffer over eight place once more. Although Palmer will no doubt get the plaudits, keeper Matt Macey deserve a great deal of credit for the victory, with two superb saves, while the recalled Olly Lee also gave a performance of real endeavour and no little quality too. Town chief Nathan Jones made three changes to the side, with the main news being the return of star striker Danny Hylton from a tight hamstring that had kept him out of the 2-1 defeat at Colchester last weekend. Lee was back in too, with James Justin returning as left wingback, as Jones reverted to the 3-5-2 formation that saw Hatters at least show signs of improvement during their loss to the U's. The hosts started positively too, looking to banish any lingering memories from last weeks' horror opening 45 against Colchester, Isaac Vassell driving at the heart of Pools' defence and unleashing a low drive that deflected behind for a corner. A bout of head tennis ended with Hylton's volley easily handled by Lyness, before he was put through by Vassell's flick on 21 minutes, seeing a left-footer repelled by Blackpool's stopper. Alan Sheehan opted to go for goal on his own, springing forward and not missing the bottom corner by much, but despite Luton's monopoly of the ball, the Tangerines weren't far away from an opening midway through the half, Colin Daniel's excellent left-wing cross glanced narrowly wide by former Town striker Mark Cullen. Hylton showed some lovely feet to set Vassell free but with Lawson D'Ath unmarked in the middle, the striker went for goal, Lyness diverting over the bar. Macey, who had come under fire for his recent display against Newport, then performed heroics to turn Bright Osayi-Samuel's effort over the bar as the winger's mazy run and curling effort looked destined for the top corner, until the on-loan Arsenal stopper somehow twisted his body to flip it behind. His next action was easier, claiming Neil Danns' shot after the midfielder waltzed past a few timid challenges from his counterparts. The opening exchanges in the second period came and went with little or nothing to write home, until out of nothing, both keepers made wonderful saves in the space of a minute to keep the scores goalless. First, on 66 minutes, Macey somehow bettered his effort from the first half, flicking out a hand to tip Kyle Vassell's acrobatic overhead volley on to the bar and over, handling a follow up header too. Then barely 60 seconds later, when the visiting defence got themselves into a tangle, Lyness got down swiftly and smartly to prevent Pelly-Ruddock Mpanzu's angled drive breaking the deadlock. Lyness just about beat Hylton to Stephen O'Donnell's cross, with Jones ringing the changes, Palmer being followed on by Jack Marriott and Gambin. They proved excellent alterations too, as Gambin shot, Lyness fumbled and Palmer did the rest, meaning Luton's players could finally celebrate a first home win since Valentines Day, giving their play-off hopes a real shot in the arm too. Hatters: Matt Macey, Scott Cuthbert, Glen Rea, Alan Sheehan, Stephen O'Donnell (Luke Gambin 86), James Justin, Pelly-Ruddock Mpanzu, Olly Lee, Lawson D'Ath, Isaac Vassell (Ollie Palmer 66), Danny Hylton (Jack Marriott 75). Subs not used: Stuart Moore, Tyreeq Bakinson, Akin Famewo, Jonathan Smith. Blackpool: Dean Lyness, Kelvin Mellor, Clark Robertson, Brad Potts (Sanmeil Odelusi 86), Mark Cullen (Kyle Vassell 66), Jordan Flores, Tom Aldred (C), Bright Osayi-Samuel (Nathan Delfouneso 66), Colin Daniel, Jack Payne, Neil Danns. Subs not used: Sam Slocombe, Will Aimson, Ian Black. Booked: Danns 52, Lee 75. Hatters MOM: Matt Macey. Two absolutely wonderful saves ensured Palmer's late strike was the winner.